Karen Gale started her farming business as soon as she graduated from the Farm Business Planning Course in 2013. At first, she started on a New Entry incubator site in Dracut, but this year turned her backyard at her home in Plymouth, MA into an expansive 1/10th acre farm growing over 50 types of crops, from vine fruits to hard-neck garlic. 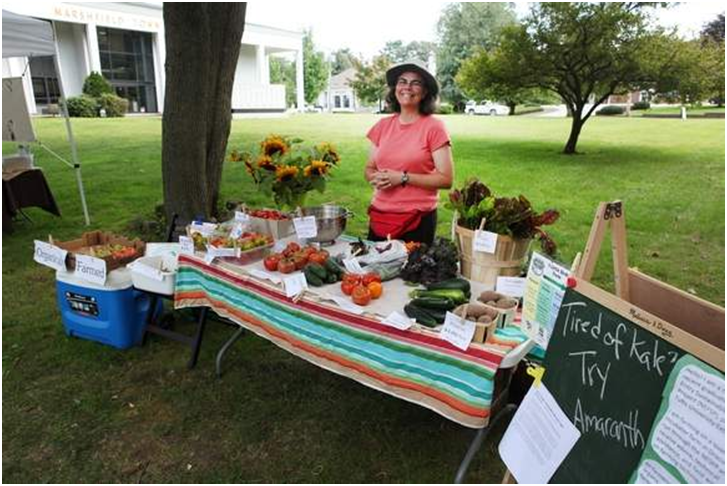 When she is not working at her part-time job at the public library, Karen devotes her time to growing her farm business. She has already accomplished her initial goals of starting a CSA and a vegetable order list. Karen has experimented with a number of different selling methods for her vegetables. She sells through WorldPEAS, has a CSA and has participated in farmer's markets. This year, she started what she calls a “micro-CSA” of 3 shareholders for 20 weeks. She wanted to keep it small for her pilot year so that she would be able to make mistakes and learn from them on a smaller and more recoverable scale. The verdict from her CSA customers: So far, so good! Recently, Karen has found a way that she believes is the most sustainable and economical way to distribute and sell her vegetables. She gathered a list of over 20 clients, mostly co-workers and friends, and started a weekly vegetable order list. Karen sends out an order form by email to all her clients at the beginning of the week and her clients have until Wednesday to return a filled-out order form. On Thursday, Karen picks the vegetables that were ordered and delivers them that day to ensure that she is delivering the freshest produce to people in her community. In contrast to selling at farmer's markets, this way saves both time and waste. Karen is happy to avoid the time wasted setting up, taking down and waiting for customers to come to her vegetable stand. She is also happy to eliminate waste of her produce because she only picks what she knows her customers want. Most importantly, she enjoys the relationship she has developed with the people on her weekly ordering list, and feels a deep sense of pleasure from feeding people. After seeing this success, Karen would like to expand her CSA to 10 members and would also like to take on new clients for her weekly ordering list for next year. One of Karen's challenges so far has been simply making a profit. She cites the Dracut farm as being helpful to new farmers because they don't need to worry about the costs of amenities such as irrigation. While learning how to manage her farm on her own, Karen has a goal of being profitable after factoring in such costs.